A Twilio account: If you don't have one, you can sign up on Twilio.com. We recommend using a trial account to get started. A Twilio-specific phone number, shortcode or an alphanumeric id: You can't use your own phone number to send SMS; you need to purchase a number from Twilio. You can do so from your account page. If you already have a Twilio-specific number, make sure to have it at hand when you're composing your message later. Similarly, if you're in the US, Canada, or the UK, you can use a short code: a 5- or 6-digit number that can send and receive SMS/MMS. They need to be leased, and Twilio can do so for you; you can read more on Twilio's documentation page. Alternatively, if you have a paid Twilio account with Alphanumeric Sending enabled, you can send using an Alphanumeric ID in Customer.io instead of a Twilio phone number. Note: You might also see a set of test credentials for Twilio in your account page. To send SMS with Customer.io, you'll need to use the Live credentials, not Test. To make sure that you can reach your customers via SMS, you'll need to make sure that you have the right data in Customer.io. Most importantly, you will need to store a phone number for customers (for example, an attribute called phone). Ideally, this number will be formatted in E.164 format. This is very important. 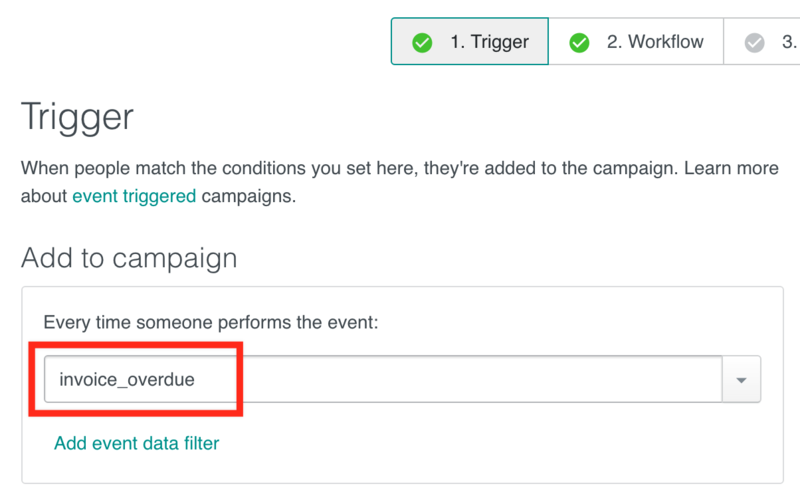 If it's not used, the likelihood that your message will be sent is lower, because Twilio has to try and detect the number format, and that detection may not always be successful. More specific information about E.164 (and other phone formats) on Twilio's support site. Note that the phone number is E.164 formatted! Once you successfully enable Twilio, you'll see your synced phone numbers (and short codes, if you're using them) below your credentials. 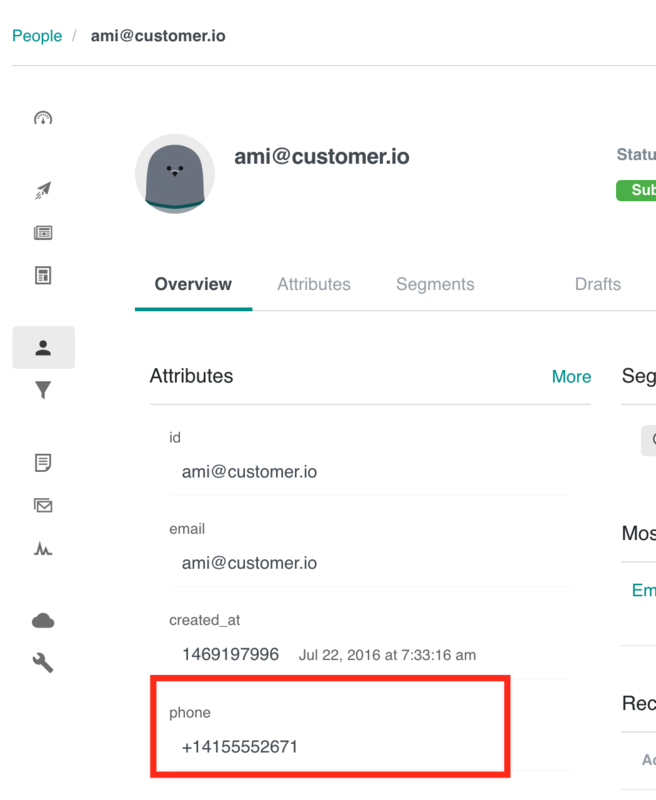 If you add or change phone numbers in your Twilio account, re-sync here so you can use them in Customer.io. You'll also see Alphanumeric IDs in your Twilio Settings. Adding one of these is simple: tell us the ID you want to use, and choose a name (how you refer to it internally; your customers won't see this) and save. You can use both upper- and lower-case ASCII letters, the digits 0 through 9, and space. It can't be only numbers. If you need it, Twilio have documentation on how to activate this feature. If you want to add an A/B test, now's the time! Just click the "Add A/B test" button, or see more detailed instructions here! 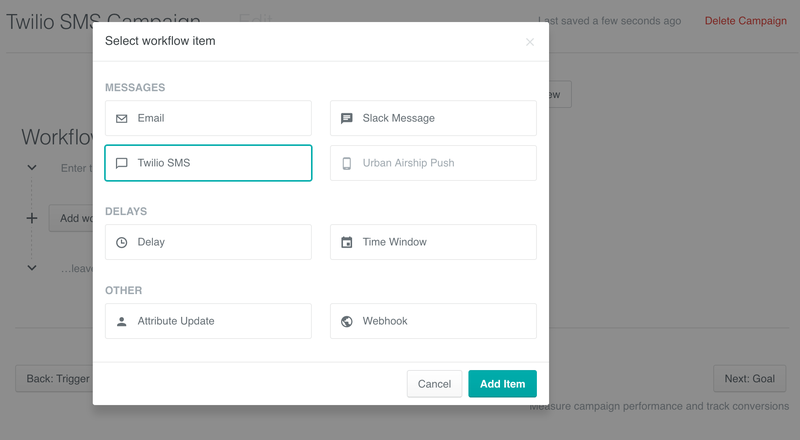 Next, click Add Content to open the SMS composer and set up your message. Note: You can use Liquid here to send to your customer’s phone number, or to address them personally, if you'd like. Just make sure you have the right attributes for that user. You can see this in action in our example below, or click here to learn more about Liquid in Customer.io. If you use Alphanumeric ID here, remember that you must have the feature enabled in your Twilio settings, and users cannot reply to it: it's one-way only! To make sure your SMS works, you can send a test message by entering a phone number in the test box (shown in the screenshot below), and clicking "Send Test”. 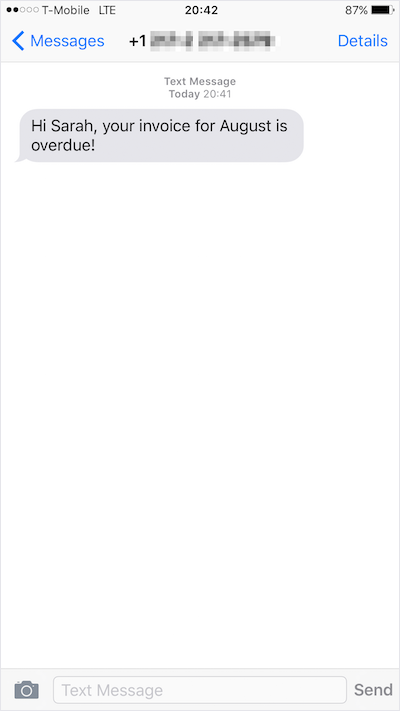 This will send a real SMS, so make sure you're sending the test to yourself (or a test account)! 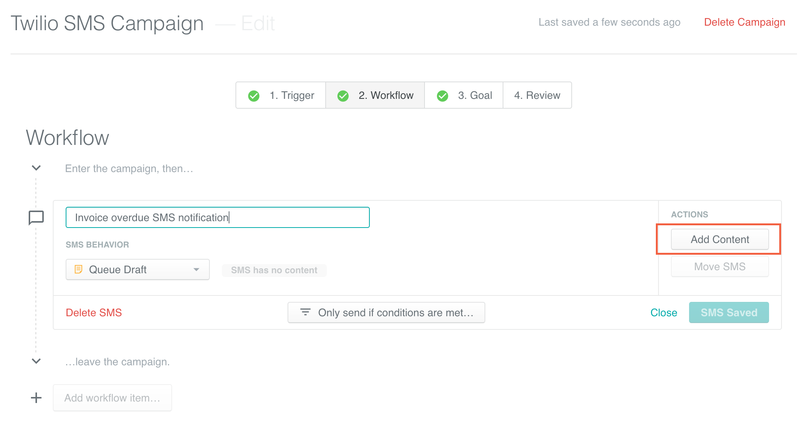 Once sent, Customer.io will show you the response from Twilio, and you should see Test sent. The SMS should then appear on your phone (or whichever number you chose to send it to)! 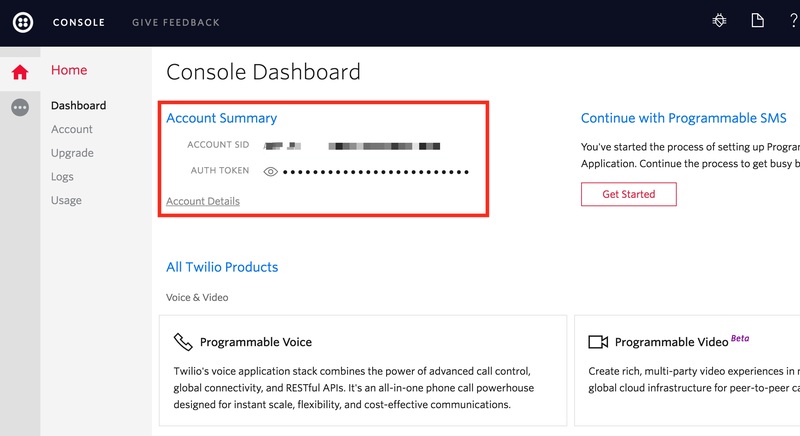 We have a separate guide for tracking your sent Twilio messages. If you have questions, feel free to have a look at the FAQ, or let us know! We're happy to help.